Tough, versatile laptop that’s perfect for students. Computers in schools take a lot of abuse. 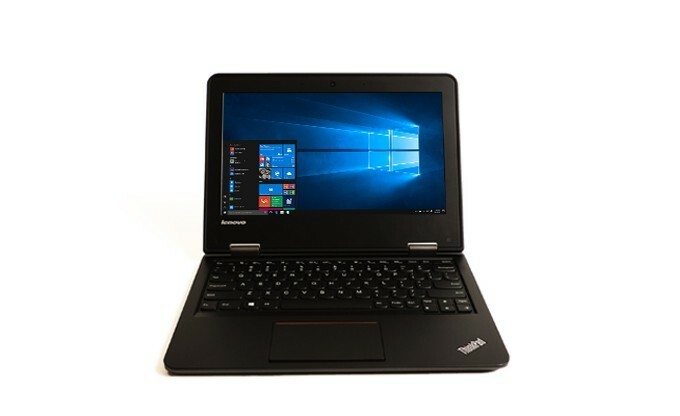 So Lenovo® has developed the rugged ThinkPad 11e and ThinkPad Yoga 11e laptops to perform and last longer, even under the roughest handling. 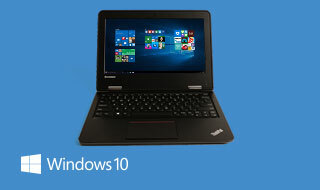 They truly do perform with powerful Intel® processors and Windows 8 OS. Plus, these ThinkPad come with an option of Intel Education Software for students, teachers and IT staff. Operating system Windows 10 Pro 64 / Google Chrome. The 11e can be used as a 2-in-1 with the touchscreen and stylus pen for the interactive editing and use. Then there is the clamshell option that o ers the traditional use. Powerful Intel® processors deliver real performance along with integrated Intel® graphics, 11.6” HD displays, up to 8 GB of memory and a range of storage options. Rugged and durable for even the toughest treatment, 11e passed the most rigorous MIL- SPEC testing. It’s ready for everything from the classroom to the great outdoors. Educators and students recognize the value of environmental awareness. Increased post-consumer content makes this a greener, smarter choice. The DB80 is an ultra-compact, high-performance external CD/DVD writer, designed for Lenovo devices. It offers superior CD/DVD read/write to provide stable disc burning, media playback and software installation. The Lenovo Security Cable Lock allows you to help reduce theft and manage physical security access wherever you need it. One piece design for easy use. Lightweight ( 130 g / 0.29 lbs ) design is ideal to carry in a carrying case for extra security when traveling. The portable, ambidextrous Lenovo Wireless Laser Mouse is perfect for anyone looking for a compact mouse to use every day and while on-the-go. Scroll through documents, spreadsheets, and more with increased accuracy and control - plus, an advanced power management system, a high-efficiency laser sensor, and an off switch help to maximise your battery life.